Urban development consists in a great extent of a building demolition. There is always a need either to reconstruct ageing buildings, which no longer comply with up-to-date requirements or purposes that a building served for, or to make space for new structures. This creates new opportunities for demolition companies and reconstruction services. Although it may seem that demolition relates only to knocking a building down, present demolition encapsulates a number of services that are performed well in advance of demolition itself, during the act of destroying a structure, as well as activities to be performed to leave the site ready for development. These include performing a thorough survey in order to assess the scope of works to be performed, salvaging of materials, detecting and identifying hazardous materials together with their removal, management of demolition debris, and cleaning the site. Professional demolition contractors have an extensive experience in performance of such services. Furthermore, performing the aforementioned activities on your own may not only be a cumbersome task, but also may pose serious risks to your health or even life and to the environment. Regardless whether you need to destroy a structure in the suburbs, where there is ample space around, or a building in a city centre, adjacent to other structures, when using professional demolition services you may sit back and be assured that professional demolition company performs the task efficiently and safely. By combining specialised equipment with our experience and by meeting highest industry standards, decontstruction firms can minimise impact on your neighbours and to assure safety not only to team members but also nearby buildings and people walking by. There are various types of building demolition one may need, as it not necessarily always means tearing a building down, as mentioned before. Nevertheless, each building demolition project entails, for the demolition crew, exercising an utmost care to planning, so as the services will be tailored to the needs of individual customer, extreme safety will be taken in order not to pose any risk to adjacent buildings and their inhabitants, demolition crew, nor the environment. Our demolition company offers soft-strip demolition services. It is a key element of each demolition project as it consists of taking major, valuable and easily removable items, equipment, materials with a potential to be reused out of the building. We perform soft-strip in a building undergoing refurbishment, where certain parts of the building's main structure remain intact, as well as in total demolitions where this service is considered to be an initial stage of the project. Although it is quite intensive in terms of labour to be performed, it provides great opportunities to salvage materials for further use or recycling. A demolition technique applied to high-rise buildings, especially those in tight spaces and surrounded by other structures, is floor by floor demolition also called a top-down demolition. As soon as the building has been soft-stripped, so that it may appear that it is only a concrete shell, the building may be demolished progressively form the roof to ground. Firstly, the roof installations, such as elevators or air conditioning, are removed so that they do not fall down during demolition, as well as balconies or terraces should be demolished. In order to minimise risk posed to people working on heights while performing a demolition of high-rise structures, professional demolition companies employ in their work long-reach and high-reach machines. They come in handy even in spaces with neighbouring structures as the machines are relatively quiet. We equip our machinery with a number of attachments to facilitate demolition of the most demanding structures of a given building, which include reinforced concrete or steel structures. For structures surrounded by ample space, one may employ a technique of building demolition with the use of explosives. Even though explosive demolition requires a thorough planning and performing an utterly careful preparation, which obviously takes some time, the whole preparation stage is later offset by the time of the demolition itself when a building collapses within a blink of an eye. Explosive building demolition is a technique chosen for buildings the structure of which contains reinforced concrete and steel. An experienced demolition team has to take into account each and every industry norm and standard relating to explosive demolition and perform a fair number of actions in advance. There is a survey to be conducted in order to decide where explosive materials should be attached, direction which the structure should collapse in, placing a blast shield, determining explosion area, persons allowed to enter it, as well as people who shall be evacuated before the commencement of demolition and alike. Each action should also be recorded in a project documentation so that it is ensured that the action was taken accurately, appropriately and in a manner meeting standards. In terms of urban development, there are two major types of demolition service that relate to urban areas. These are industrial and commercial demolition. In past years, many cities or districts served as an industrial hub, but due to economic decline are no longer exploited to such extent. As a result, cities are left with plenty of abandoned factories and other buildings, which nowadays need to be either restructured or completely removed to be substituted with modern structures. The aforementioned two types of urban demolition projects differ in terms of buildings they pertain to. Industrial demolition therefore is demolition of various plants, such as chemical, pharmaceutical or power ones. Commercial demolition on the other hand relates to demolition of offices, stores, storages, etc. Both types of demolition however are performed on rather huge buildings, typically with lots of space around, and with the use of specialised equipment and demolition machines. In certain cases there is a need not for a demolition itself, understood as a knocking-down an entire building, but for a service of industrial dismantling and deplanting. The process is specific for plants, which commission our professionals a task of removing a damaged or old part of a system or an installation while the whole factory remains in operation. We are well aware that such undertaking requires an utmost care in planning and taking special precautions so as there is no risk to pose harm both to the plant workers operating the neighbouring parts of the system or installation, as well as our team due to working in the proximity of live machines. We also take note of the importance of minimising outage in the factory's production process, that is why we employ latest dismantling techniques and offer best machinery moving services to perform the task as quickly and efficiently as possible. It is not surprising that there is a manifold of materials and substances one may encounter on the demolition site, including hazardous ones. Therefore, demolition, or even tasks aimed at preparing the site for the demolition should not be done by yourself as such materials pose a serious threat to your health when handled inappropriately. 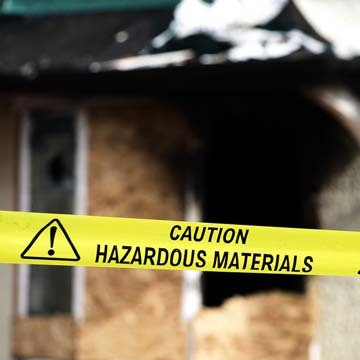 Materials are considered to be hazardous if pose risk of causing harm to people, animals or environment, due to direct or indirect influence and if are toxic, ignitable, corrosive or reactive. In order to remove hazardous substances from the site in the conformity with applicable standards, we undertake a number of tasks. They include, first and foremost, sending a qualified specialist to perform a survey in order to detect and identify the hazardous materials, providing a survey report stipulating the location, characteristics and quantity of such substances. Furthermore, haz-mat professionals enter the site with personal protection equipment and remove and dispose of materials in a safe and appropriate manner. Many buildings, especially these of residential nature, may contain asbestos within their structures. It is highly dangerous when inhaled or ingested. It may be present in thermal system insulation, acoustic ceilings etc. posing a particular threat for maintenance workers, who drill holes for cables and ducts. Any use of pneumatic tools makes the asbestos fibres release to the air and may be easily inhaled. Asbestos abatement, therefore, mainly rests on manual removal, optionally with the use of power tools so that the risk of spreading asbestos particles into the air is minimised. It is also lead which may be encountered on demolition site and included in the list of hazardous substances. It appears mainly as part of paint used in buildings erected before the 1980's. Unless debris covered with a lead-based paint do not exceed Maximum Contamination Levels as assessed by relevant authority, it will be handled as normal debris. Otherwise our professional removal companies disposes of lead-covered parts observing applicable standards. As long as hazardous materials are present on site usually in rather small amounts, there are certain resources to be removed, which can be counted in hundreds of kilograms. One of these is steel, which can be found as part piping or ductwork systems, a building's primary supporting structure etc. It is therefore worthwhile to consider which option to choose from the available ones while getting rid of steel structures. The first one, which actually is not an option at all, is dumping the scrap metal to the landfill, often at a high cost. One may also recycle steel instead of sending it to the landfill. As compared to the latter, one at least does not have to pay for leaving the material, as recycling is free of charge. The most frequently chosen option however, for obvious reasons, is selling the steel. We help our customers sell the scrap metal, which effectively minimises project costs. But before we decide what to do with the salvage material, our company has to perform the steel structure removal first. We facilitate our work by using professional equipment to cut the steel into pieces that will be easy to manage. If the structure is particularly big, qualified professionals may use explosives. The places where structure is to be weakened as well as supports are found, and explosive material is affixed. Then the structure collapses in a desired manner and direction, and may be cut into manageable pieces. Finally, the scrap metal undergoes sorting in order to separate radioactive materials, as well as ferrous from non-ferrous pieces. Similarly to steel, one may expect to find a great amount of concrete on the demolition site, as this material is probably the most commonly used in construction. It may not seem obvious at first, but concrete is also a material that can be recycled, and that its recycling generates income helpful in balancing demolition expenses. Again, taking into account that crushed concrete may be reused in a multiple ways (e.g. to create a new one, for levelling purposes, for walkways, road bases, etc.) it is not reasonable to dump the huge amounts of this material to landfills and pay for it. In order to reuse concrete, however, certain actions have to be undertaken first. The major one is tearing the building down which is effected with the use of either explosive materials, or professional machinery (excavators of long- and high- reach, additionally equipped with demolition attachments like scoops, shears, hammers, breakers etc.). Furthermore, demolition crew is responsible for separating other materials such as steel, glass, wood and other. For pieces of metal the crew makes use of excavators with magnets attached. The final stage is concrete crushing. In order to perform it, you may choose among two options. The demolition crew may either transfer the concrete to a recycling plant, or provide a crusher to the site. The crushers are loaded with the excavators, and the process of crushing repeats until one obtains the desired concrete size for the given purpose. There are 3 main types the concrete crushers may be divided into: jaw, cone and impact crushers. The crusher type should be selected based on the purpose the concrete is crashed for. E.g. impact crushers are best if the concrete will be used for road construction purposes, but are more sensitive to reinforced elements than the other two types. Jaw crushers take even large pieces of concrete, and with the use of pressure force they break it up into smaller pieces. They are called jaw crushers because in the process of crushing the jaws, powered by a flywheel, open and close with the concrete between, which looks like a chewing mouth. In contrast to the jaw crushers, cone crusher do not chew the material, but pound it against a fixed object. They also get jammed with greater pieces of material less frequently than jaw crushers. By adjusting the position of a crushing cone up or down, one may more precisely adapt the target size of grains. Impact crushers, on the other hand, neither chew or pound the concrete, but use an impact force while smashing the material pieces against a breaking plate so that it is smashed into bits. It is difficult to imagine that any work is performed by hand only nowadays. Our demolition company eagerly employs state of the art technologies and professional machinery to perform the task as efficiently and safely as possible. Machinery allows to reduce the effort put by our team members as well as the overall project duration. Machines used in the demolition project most frequently are the aforementioned long-reach and high-reach excavators. When equipped with one of a manifold of available attachments they are tailored to the needs of a particular demolition project and provide a possibility to perform various task with a single machine. Generally, excavators are used when either there is a need to facilitate a floor by floor demolition, or reach the interior of the structure to remove the contents without the crew members being endangered by falling debris. Long-reach excavators extend their arm to the height of up to 160 ft, and long-reach excavators reach as far as 150 ft.
With a scoop an excavator is able to facilitate cleaning the site from debris, crushers are used to crush concrete into gravel-like particles, hammers and breakers to manage breaking hard materials much more controllably than with the use of a wrecking ball, magnets facilitate separating steel from other materials, spray nozzles reduce pollution of air by dust by even 90% when sprinkling water over the site, cameras to provide the operators with a more precise visibility which reflects in greater safety, and shears to handle steel. While one can easily imagine how much debris is produced during demolition, it may seem not so obvious that proper construction and demolition (C&D) debris together with asset recovery service may, certainly in part, and possibly even completely, offset demolition costs. 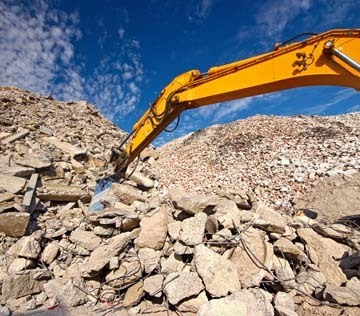 At the very first stages of a demolition project, a professional demolition company assesses the amount of assets that can be recovered, such as concrete, steel, piping, glass, machinery, flooring, bricks and many more, not only to allow you to get some money back, but also as a part of green demolition practices. Salvaging a fair amount of materials allows us to save space on already-overfilled landfills. Another green demolition services include actions taken to protect the storm drains against pollution. Such activities should be considered as a priority in urban areas where the storm drains are in a close proximity to the demolition site. The flow of water on site should be carefully planned and controlled so that it does not get contaminated. There are provisions and standards regarding not only water but also air to be observed in consideration for the environment. In order to minimise air pollution by dust emitted on the demolition site, the building to be demolished should be in advance soaked with water. Moreover, with the use of professional demolition equipment such as spraying nozzles, our demolition team sprinkles water constantly over the demolition site so that falling debris of a knocked-down building will not produce an overwhelming dust curtain. In order to avoid flooding, we employ certain precautions and take an utmost care to prepare an efficient floor drainage system.